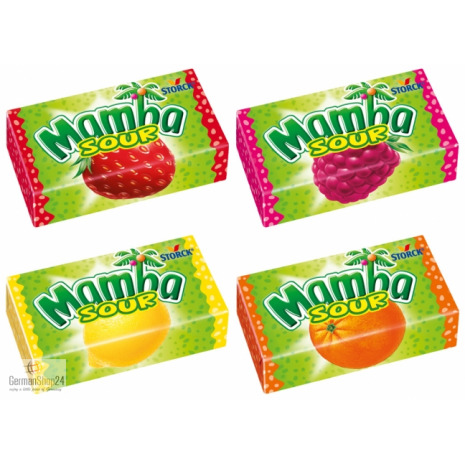 Individually wrapped chewy candy pieces in the flavors strawberry sour, raspberry sour, lemon sour and orange sour. 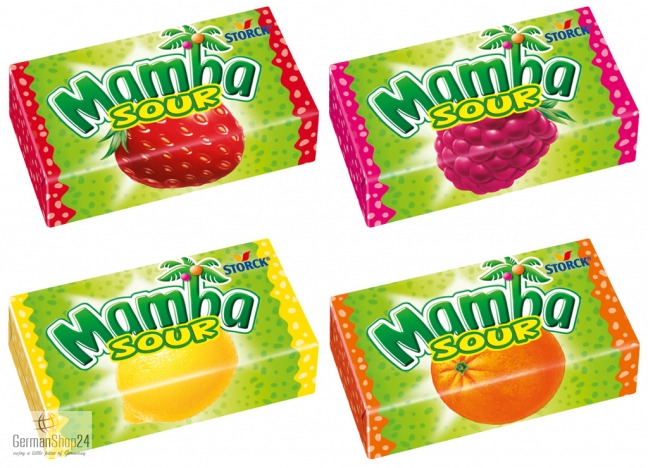 Mamba Sour, that's the sour chewy candy fun in four fruity flavors: strawberry sour, raspberry sour, lemon sour and orange sour. 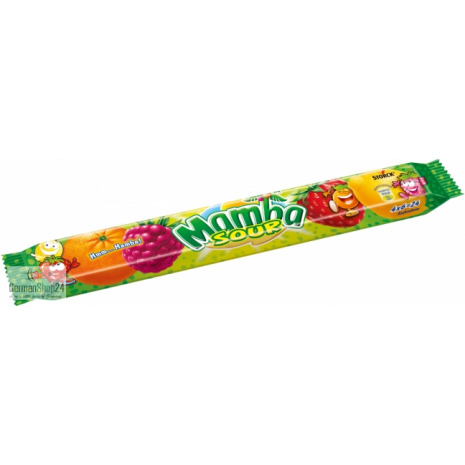 It tastes fruity and sour and is perfect for sharing with your friends. Four individually wrapped packs each with six individually wrapped chewy candies are in every stickpack. 106g / 3.74 oz NET. WT. Glucose syrup, sugar, vegetable fat, humectant sorbitol syrup, modified starch, malic acid, flavoring, concentrated elderberry juice, vegetable extracts (paprika, turmeric), emulsifier polyoxyethylene-sorbitan-monostearate (polysorbate 60), antioxidant alpha-tocopherol. Glukosesirup, Zucker, pflanzliches Fett, Feuchthaltemittel Sorbitsirup, modifizierte Stärke, Säuerungsmittel Äpfelsäure, Aroma, konzentrierter Holundersaft, Pflanzenauszüge (Paprika, Kurkuma), Emulgator Polyoxyethylen-sorbitan-monostearat (Polysorbat 60), Antioxidationsmittel Alpha-tocopherol.